← Tia Babe’s and the Return of Me! As most of you know, the majority of my reviews on EatMeCalifornia are positive ones. After all, we want to promote local businesses that have great food, great service and all the things that make a meal memorable. CJ’s had none of that. In fact, when scouring my experience for positive things to say, I only found two. First, CJ’s serves barbeque. Second, their spicy barbeque sauce is really good. Unfortunately, they don’t serve anything that I’d like to put the aforementioned sauce on. I didn’t take a picture of the front of this place, mostly because I don’t want you guys to go there. Here’s why…I was totally in the mood for barbeque, so I take full responsibility for dragging Mikey into this. We went in with the best of intentions, but soon realized that the owner, or at least the guy I assumed was the owner, could care less if we ate in his restaurant. If I hadn’t been so hungry, we might have left. Instead, we got some good material for the site. As I stepped to the counter to order, I immediately felt like I was inconveniencing the owner. Not a good way to feel when you’re about to shell out hard earned bucks for a meal. 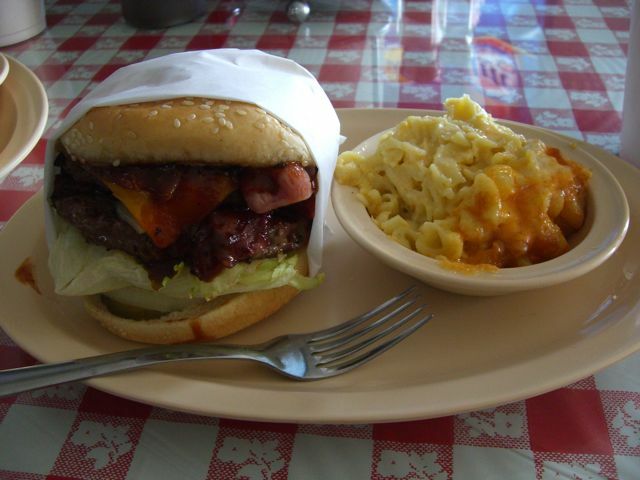 I ordered the CJ’s Special Burger, which sounded really good. The gentleman behind the counter then asked me what I wanted for a side. I had just assumed that it came with fries, so I went ahead and asked him what my options were. Instead of telling me, he proceeded to give me the slow turn + exaggerated point to the menu. Now, I’m a pretty easy going guy, but when you treat me like I’m retarded I’m probably going to take notice. I bit my tongue and decided to try the mac and cheese with my burger. Mikey got the tri-tip with potato salad and berry cobbler. This is the kind of place where you order at the counter and they bring it out to you. I realize that you don’t tip the waitresses at restaurants like this, but usually they are still cordial when they bring the food around. In this case, the girl who brought our meals was surly and basically dropped our plates on the table and walked away. Strike two, CJ’s. Strike two. The burger itself was fine. It had two patties, pastrami, bacon, swiss and cheddar cheese and a nice bbq sauce over the top. Unfortunately, the bottom part where the lettuce, tomato and onion resided, was coated with some kind of mayo-thousand island blend. I don’t ever think that a burger should have more than one sauce, especially one that isn’t listed on the menu. BBQ or mayo is fine, but not both. Also, there was a salad sized portion of lettuce on the burger. I ended up taking most of it off and using it to scrape away the excess mayo. The beef was tasty, as were the bacon and cheese. The pastrami, however, was too thick and had a lot of gristle. It didn’t add anything to the burger at all. The mac and cheese was gross. You can tell from the picture that it was scooped out of a huge tray because you can see the cheesy top part clinging to the side of the dish. It was bland, unseasoned and all the table salt in the world couldn’t save it. I wish I would’ve just gotten fries. That’s what I get for being adventurous. Mikey’s tri-tip was pretty good except for the one piece that was overcooked, but his sides were, if possible, worse than mine. I want to start there because Mikey has been sick as a dog today and we’re pretty sure the potato salad is the culprit. It had an obscene amount of mayonnaise, so much so that I wouldn’t even try it. Thank god I didn’t because I’m fine today and it’s the only thing on his plate that I didn’t try. The “berry cobbler” was a soupy concoction that reminded me of blueberry pie filling, except the blueberries were the pea sized, canned variety that you get with store-bought pack of blueberry muffin mix. As you can also see in the photo, the crust was non-existent and there was no way that I would have ever had the balls to call this thing a cobbler. I don’t feel bad about writing this honest review of CJ’s barbeque because I honestly don’t think the owner gives a damn about what his customers think. Most of the restaurants we review bend over backward for their patrons. In this case, it felt like he had a sense of entitlement. Maybe if the food had been on the other side of average, it would have been justified. But it wasn’t, and I wasn’t in the mood to be treated like a moron. We don’t really do a review system like zagat’s, but if we did… Two thumbs down, 0 stars, do not pass go, do not collect $200 dollars. In fact, I want my money back. I totally agree with the comments about service. I just live down the street & have eaten there a few times due to convenience. Every time I’ve been, I have been given the same attitude; we don’t care if you eat here or not. All the help is pretty rude. Last time I was there, I spent over a hundred dollars on take-out. I ordered baby backs & regular pork ribs. They gave me beef ribs instead of reg ribs. I called & they insisited the had given me pork ribs. I am from Texas & I know all about BBQ. They were beef ribs. Was told if I brought them back, they would give me a PARTIAL credit for them !! And the manager said she remembered me since I had been there a few times. That is how they treat you. Needless to say, I haven’t been back !! okay…. that potato salad is so wet I thought ti was mash taters……and who was so high in the kitchen they didn’t put a topping on a cobbler? Very sorry you had to edure that…and sorry it made you ill….. now please stop trying to make rat traps into silk purses and come have a fun evening at Laurel Tavern with me. We are gonna do this. Trust me. It’s just this week is a little on the booked side. I do need to take a friday off from hitting the bottle as I’m feeling a bit lush-ish lately. Is friday night do-able for ya? Or do you have another preference? wow… thats pretty bad..I hope they either read or hear about your post.. whata bunch of jerks! If they do hear about it, I hope they change. Otherwise they really are just a bunch of jerks. Yeah I totally thought the “potato salad” was mashed tatoes. I hate potato salad anyway, and it should never be mistaken for mashed tatoes! Poor mikey spent yesterday doing the couch to bathroom shuttlerun. I’m glad I don’t like potato salad or else I would’ve been doing the same. I thoroughly disagree. I’ve never been disappointed with a meal at CJ’s. In fact, I’m going there tonight! Their bbq chicken is exquisite. I can totally see how this happened. The food is mostly very good at CJ’s, but after you get a load of the employies there, you may not care for it. Those guys are always a bunch of ****’s. I’ll just edit myself here because there’s no nice way to say it. The servers there really need a beating or some other kind of aditude adjustment. You also need to know what to order. I try ALOT of BBQ places(I wish some others were this close to my home) and it’s a RARE BBQ joint that makes EVERYTHING great(It’s in The Sauce in Ventura is the place to go around here, no question!) 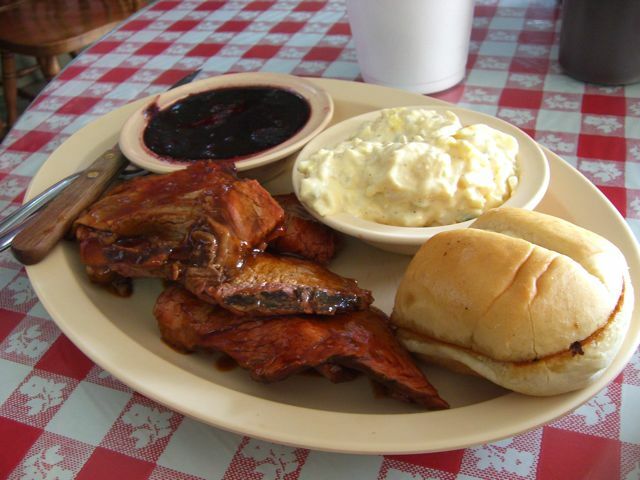 At CJ’s, the sauce is great, so items that make the most of it are what to get–ribs, tri-tip,chicken. It’s alot like Tony Roma’s(maybe a rip-0ff?) very yummy. And for sides, thier Chili Beans are EXCELLENT(a regional favorite with BBQ) also thier Collard Greens! Never dissapoint and are delicious and actually healthy and almost as good as It’s in The Sauce’s As far as desert, try thier Sweet Potato Pie and that alone might bring you back ! One more thing….I NEVER EAT IT THERE! it’s a take-out joint, even if they have tables! Call it in, pick it up and never worry about a tip they don’t deserve. Hey, BTW, what IS the opposite of a tip anyways? These people catered a after family gathering for my father’s funeral last year. I was told it was the best BBQ and all the sides were delicious. We had the BBQ chicken and it was CRAP!… the food was horrible! I was so embarrassed when I also found out they were one hour late and guests waiting for the food! I have also heard from friends that have been in the resturant that the service there is just like Brian experienced. How sad! Get some real employees and better food… and yes It’s In the Sauce is so much better! Update on CJ’s —I still go there maybe once in 6 weeks time as it’s really close-by and if you know what to order there it is good. They hired a few pretty young girls to take orders-so you don’t have to deal with the guys there at all anymore—as for catering? Yeah-I wouldn’t depend on them. Also new in my area is Smokey’s(at Victoria & Wooley) Tri-tip is AWSOME and so is thier munchie stuff and strangley their breakfasts! A few years ago the owner of CJ’ bought a BBQ/breakfast place in Ventura. I worked fo r the restaurant when he bought it. I quit about 3 weeks after his take over. Incompitent restaurant owner! I started shifts without cash in the register and was expected to serve weekend breakfast without bacon! He didn’t care about the restaurant, employees or customers. It was no surprise when the Ventura restaurant closed. He blamed the closed minded people of Ventura. I guess it all depends on what you order. I like greens with my BBQ they were fine and I remember good mac and cheese. I also liked the chicken very much. Oh well. I wrote a letter to C J’s regarding my disappointment in receiving an order of BBQ pork ribs that was 95% fat and bone. This establishment did not even respond! You might expect some PR follow-up to say that they were somewhat apologetic for the waste of $12.00, but not this place. I will never eat there again, or recommend CJ’s!